This is the turning point where Carol's mother explains her mysteries and redefines her daughter's origins. It's the perfect setup for audacious storytelling and imaginative retcon work. Unfortunately, what we get is a safe, dull, familiar rehashing of some of comicdom's most threadbare super-heritage tropes. Combine MCU Star-Lord with a dash of Namor and some classic Superman details, mix very briefly, et voila. It's a poor fit with the long-established and still-in-continuity dysfunction of the Danvers family. This issue takes a half-hearted swing at linking Joe Danvers' alcoholic self-destruction to Carol's - excuse me, Car-Ell's - newly-revealed Kree heritage. It never really works, mostly because this issue's script doesn't do nearly enough to explore Joe's expectations. Did he want some sort of exciting adventure-life as the husband to an alien hero? Did he want Mari-Ell to give up her Kree-ness completely and be a Stepford housewife? I can't say for sure; I don't think the author could, either. Most likely, his motivations swung back and forth between those two poles and it was the swinging itself that wrecked his marriage. That's realistically messy. Lots of real lives have similar ambiguity. Lots of real marriages are challenged or broken by much smaller points of friction. Realism isn't usually a problem in fiction. But in this comic, realistic family drama is rubbing shoulders with a "Momma's actually a flying space-soldier and now she has to fight a naked Kree Terminator on the front lawn" plot. The Kree Terminator, by the way, is called a Kleaner. That's depressingly indicative of the level of imagination invested in this comic's details. In terms of nuts-and-bolts storytelling, this comic features solid, functional craftsmanship. The script plugs some obvious potential plot holes. Carol's brothers, for example, are explicitly assigned to a previous marriage. That forestalls any question of why Carol alone inherited superpowers. Artistically, the issue satisfies. Both the flashback and present scenes feature impressive character renditions. There's solid expression work throughout. The fight scenes could use a little more dynamic motion and a little more clarity, but the thread of the story never truly slips away. The colour work is generally solid, and the detailed facial shading used to convey Marie's age is notably skillful. 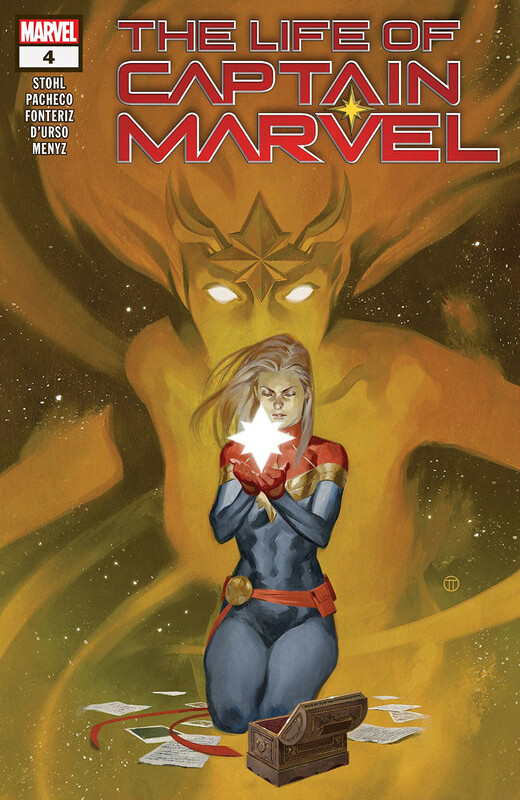 The Life of Captain Marvel #4 surrenders a lot of potential to tell a thoroughly familiar alien heritage story. That story, for all its simplicity, is told with satisfying skill. I contend that the previous issues set the stage for something greater, though. Much more could/should have been done to reconcile the nuanced family drama with the very basic space operatics introduced here. How many close Kree encounters has Carol had that would have been dramatically different if her mom had bothered to explain her heritage earlier? A half-dozen? A dozen? More?